How can we make our food delicious as well as healthy? I am sure you must have researched each and every item you cook to know its nutrients. Well, I do! No sooner I enter kitchen, than my thought process starts doing permutation combination of the items available in stock. 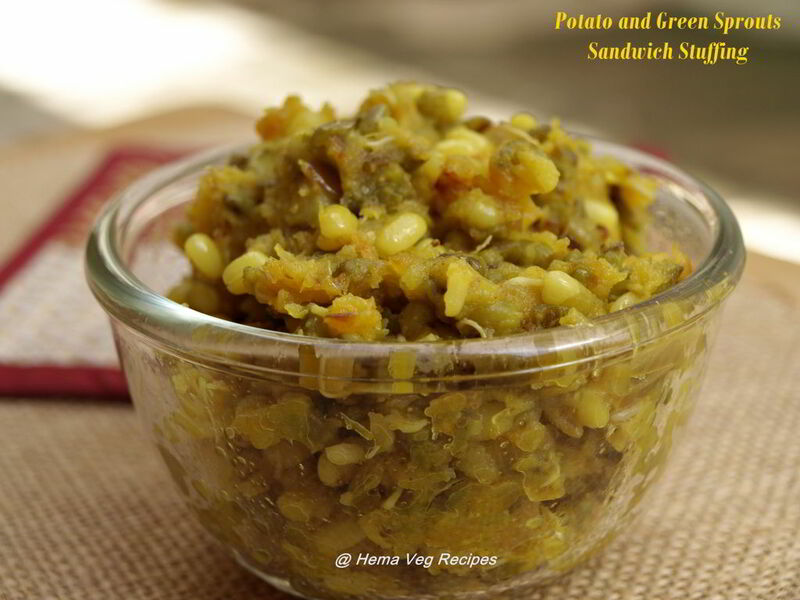 I have decided to include one item of sprouts and one leafy vegetable in my weekly menu. Usually I prepare sabji out of sprouts. 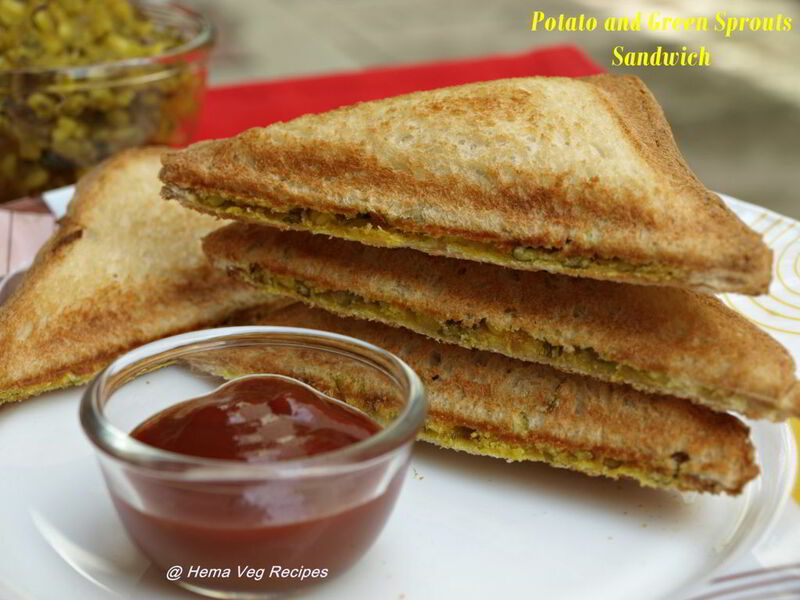 This time I thought of making sprouts Sandwich to give a change of taste in daily Sandwich Menu. More over Sprouts are said to be bag of nutrients. This time while shopping for vegetables at Namdhari’s my eyes caught sight of fresh Green Sprouts on the counter which tempted me to buy. Sprouts can be made at home very easily. Occasionally we can pamper ourselves with ready-made ones. When I planned for including sprouts in my sandwich, I was curious to know how others make. So my dear friend google gave me many varieties of sprouted Sandwich. Yet, this enthusiastic brain on mine wished to try my own version. End result was awesome. Hence I am sharing with you. 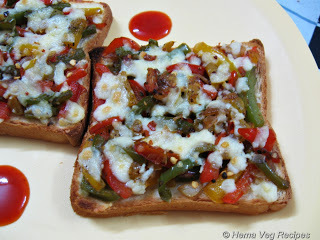 If you too make some addition deletion in this recipe, let those ideas here in comment box. My recipe is quite a simple one. Make sure you have sprouts ready on counter. Boiling the potatoes takes very less time. While you cook those two, you can chop onions, fry with powders and keep ready. Later add mashed Potatoes and Green Sprouts. 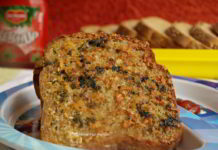 Adding Potato to the stuffing not only gives good taste, but also it acts as a binding agent to the sprouts. 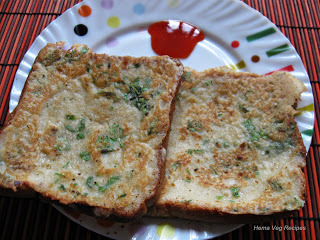 The leftover stuffing can be used for preparing Paratha also. I had little stuffing left which I made to Paratha for my daughter. She liked both the dishes and was screaming Yummy… Yummy, all over the house. To make the snack as light as possible, I did not use cheese. Even then the Sandwich was filling. 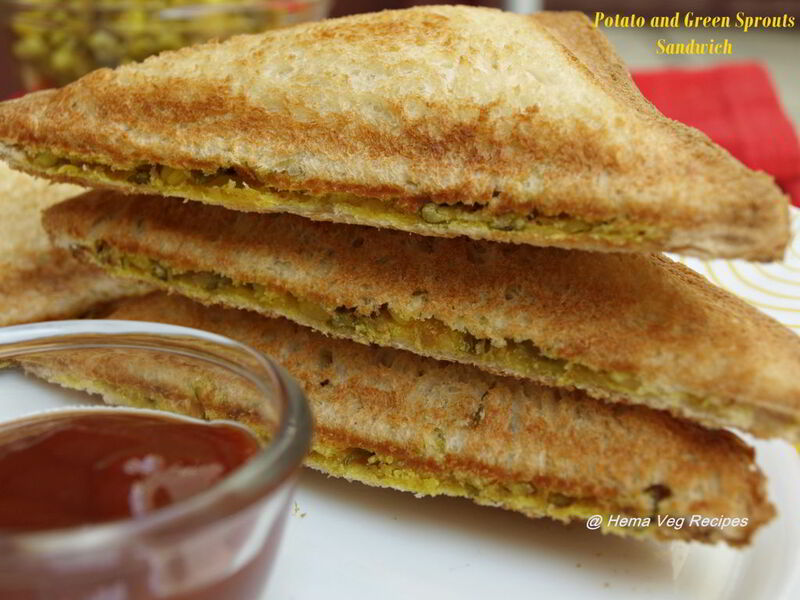 Well, enjoy this simple, yummy and healthy Potato & Green Sprouts Sandwich with Tomato Ketchup or Sauce as dipper. 1. Finely chop the Onion. Cook the potatoes for 4 whistles, once pressure eases, remove the potatoes and peel its skin. Mash these potatoes when it is hot or warm. Cook the Green Sprouts for a whistle in cooker. You can also cook in a utensil directly over flame for 10 minutes. Drain the water and mash the sprouts when it is hot. I cooked it in Microwave for 13 minutes. Ensure that the Sprouts are well cooked before you mash it. Mix the mashed Potato and Green Sprouts, keep aside. 2. Heat Oil in a Kadai, add chopped Onions and fry for a minute. Then add Ginger Garlic Paste and Green Chilli Paste. Saute for a minute. 3. Add Turmeric Powder and saute till onions become translucent. Then add Coriander Powder, Cumin Powder, Pav Bhaji Masala and mix once. 4. Next add Salt to it and mix well. Now add the mixed boiled mashed Potato and Green sprouts to the kadai. 5. Mix well so that the Masalas and Potato-Sprouts mixture gets evenly distributed. Finally add Lemon Juice and switch off the flame and transfer the stuffing to a bowl. Now the Potato-Sprouts stuffing for the Sandwich is ready. 1. Preheat the Sandwich maker for 5 minutes before you keep the bread slices. 2. 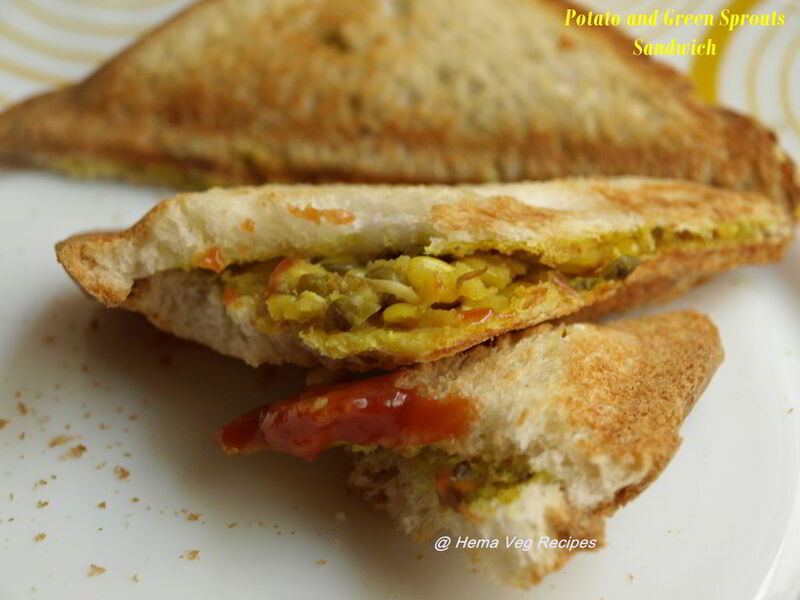 Take two slices of bread; spread some Potato-Sprouts stuffing on one slice of bread and close with the other. 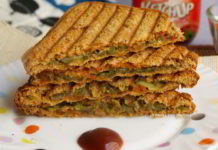 Repeat the same for one more set of bread slices if you have two partitions in your Sandwich maker. 3. Keep these two prepared Bread slices in the preheated Sandwich maker and close the lid. 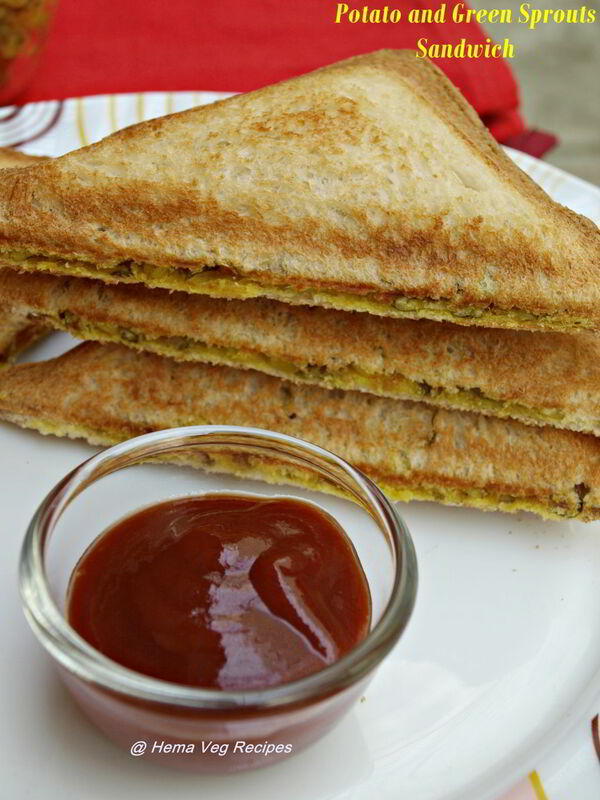 Cook for about 6 to 8 minutes depending on the capacity of your Sandwich maker. 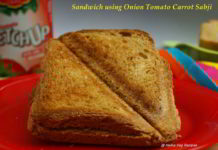 Once you take out the sandwich, it should be golden in colour crispy. Cut it into half and serve with sauce or ketchup. 1. For making green sprouts at home, soak the green moong one night in water, next day drain 95% of water and leave it partially covered for 12 more hours. For long sprouts second soaking should be done for long hours. 2. 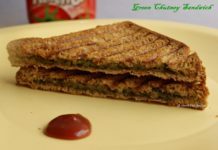 If the Stuffing is left over, you can prepare Paratha with the same.